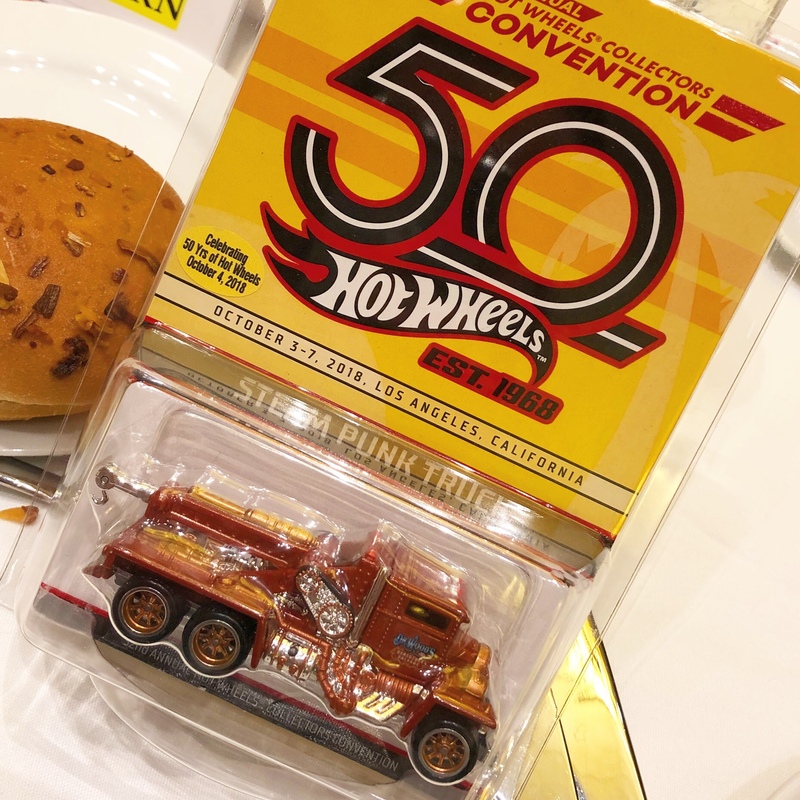 10/3/2018 — The 32nd installment of the Hot Wheels Collectors Convention kicks off today in Los Angeles. It is the culmination of all things 50th anniversary, and should be a great time for all in attendance. OTD will be reporting LIVE from LA so keep checking this page as we will update it as soon as the information becomes available. To Start things off, the list of the souvenir cars is below, and a news section that we will update as the convention progresses (until Sunday). For the list of events, check out the Convention’s web site >> HERE. Mattel Staff on Hand: Larry Wood (Mr. Hot Wheels), Phil Riehlman (Principle Designer), Steve Vandervate (Graphic Designer of HWC/RLC, Convention, Car Culture and other premium retail lines), Brendon Vetuskey (Lead Designer of HWC/RLC, Monster Jam), Bryan Benedict (Lead Designer of Character Cars), Michael Heralda (Retired Graphic Designer), Jerry Thienprasiddhi (Mainline/Basics Graphic Designer), Mike McClone (Basics Graphic Designer), Manson Cheung (Sculptor/3D Designer), Julian Koiles (Senior Packaging Designer of Car Culture, Pop Culture, Replica Entertainment and HWC/RLC), Bob Rosas (Retired Designer/Engineer), Jimmy Liu (Marketing Manager for Collector lines), Howard Rees (Former Designer), Tyler Charest (Designer), Leeway Chang (Designer/Graphic Designer), Ralph Benitez (Designer), Ryu Asada (Designer), Lindsey Lee (Designer), Dmitriy Shakhmatov (Designer), Eric Han (Designer/Playset Designer), Kevin Cao (Designer), Ira Gilford (Former Designer), Jeremy Cox (Graphics Designer), Mark Jones (Designer), Carson Lev (Former Designer), Steve Pennington, and Alton Takeyasu (Designer). RUMOR! Dinner Car will be the new Steam Punk Truck. CONFIRMED! RUMOR! Pink RLC Car will be the ’66 Batmobile. CONFIRMED! RUMOR! 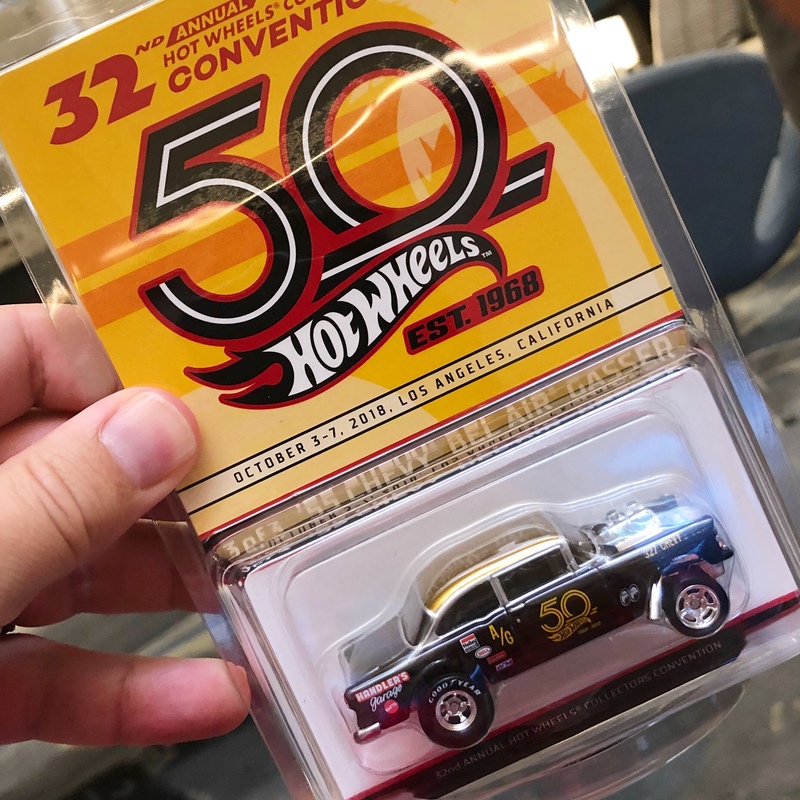 The Finale car will be the reverse color scheme of the Dallas Finale ’55 Chevy Bel Air Gasser. CONFIRMED! RLC Exclusive Car will be for sale in the souvenir room from 9:30AM to 3PM on Friday 10/3. It will cost $20, cash only. RLC Holiday Car (sold later this year on HWC) will be the Texas Drive ’em with Reindeer in the back. Sneak Peeks from Friday Night’s RLC PARTY in Los Angeles! How much are the souvenir car #1 and #2 selling at? Is that black & red car a ’67 Camaro? What line is it going to debut in I wonder? Nice! Its the Custom Camaro… 2019 RLC Membership Car. I like em all. That BATMOBILE is really cool. No matter what color the 66 BATMOBLIE is it still is a cool car. Save some BATMOBILES for us non RLC attendees please. That BATMOBLIE will go great with my XMAS one. Now bring on Rudolph. The S’Elections Z looks sharp!